DIVERSIFIED firm UCSI Group plans to spend up to RM1.13 billion to expand its business and education-based operations over five years, its chairman Datuk Peter Ng said. The group, which operates the UCSI University, is in the midst of developing three five-star hotels in Kuching, Kuala Lumpur and Bandar Springhill in Port Dickson, Negri Sembilan. Ng said in Bandar Springhill, UCSI is planning to build a university medical centre on 13.9ha with investments of RM500 million, besides a RM200 million resort hotel and convention centre. Bandar Springhill is also where UCSI University's main campus will be located. "Initially, the medical centre will hold 400 beds and will expand to 1,000 beds," he said, noting that it will feature state-of-the-art technology and a hostel for nursing students. The resort hotel and convention centre, meanwhile, are being built on a 5.6ha site comprising a 17-storey hotel with 319 rooms. Ng said the hotel will feature nine restaurants and eateries with indoor and outdoor seating, a sandy beach, a full-service spa, a roof garden, four meeting rooms, conference and seminar rooms, function hall and grand ballroom. A 14-storey residential block for students with 390 rooms will be built next to the hotel. "These projects are expected to be completed by May 2012," Ng said after unveiling the expansion plans at UCSI University's 25th anniversary celebration in Kuala Lumpur yesterday. Also present was UCSI University chancellor Tan Sri Abdul Rahman Arshad. Ng said UCSI University is committed to strengthening Malaysia's position as an international tourist destination. "To ensure the success of the university medical centre, we have to be involved in health tourism," he said. 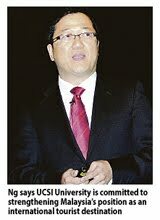 He said at present, Malaysia's health tourism was still low, with revenue of RM350 million recorded in 2010. Ng said this was due to lack of hospitals involved in the niche market. Apart from the two projects, UCSI is also setting up an international school in Bandar Springhill costing RM50 million whereby the project is due for completion by year-end. Others include UCSI CityIsland Hotel in Kuching worth RM180 million, a RM200 million UCSI tower and hotel in Cheras and an office building in Cyberjaya. "We are funding all of the projects via internal funds, disposable of fixed assets and borrowings," Ng said. The government recently appointed UCSI University to lead a national initiative to help the country achieve its goal of becoming a high-income nation by 2020. The university will chair the hospitality and tourism discipline cluster (Entry Point Project 10), one of the 131 projects under the Economic Transformation Programme.